To provide supervised overnight accommodation with food and a listening ear to genuinely homeless people who through age, physical or mental illness, youth, alcohol, or drug addiction or dependency, and/or poverty are unable to make adequate provision for themselves. Our ultimate objective is to help such people to stand on their own two feet. 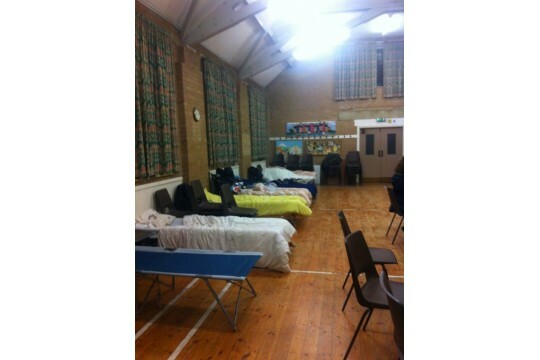 In the 2017/18 Winter there were 63 homeless people who were given accommodation and meals by the Snowflake Trust on at least one night in the Night Shelter, of whom 24 were assisted to move into their own accommodation leading to reduced ill health amongst the Guests, and less dependency on local health services. There was improvement in social cohesion by Guests feeling less marginalised following interaction with committed, respectful volunteers who are able to listen and who care about them. The Snowflake Night Shelter is the first recourse for homeless persons. Each Guest of the shelter is monitored to assess how he/she can be assisted to become self-supporting. Referrals will be made to the other local charities (eg the Seaview Project); longer-term accommodation/work (Emmaus Hastings and Rother); substance dependencies (Substance Misuse Service) and financial/housing advice (Hastings Borough Council (Housing Dep),HARC & BHT) as appropriate.